We have looked at the silicon for Intel’s (NASDAQ:INTC) new phone offerings in the last two articles, (Part 1 and Part 2) but what about the rest? The first step to figuring out how the silicon will fare is to examine what is made with it. Intel has a reference design, and it is very likely that we will see similar hardware coming from Motorola and Lenovo in short order. Some things will change, the cameras and what features are exposed are the two highest on the list, but the basics are all going to be in any of the first generations phones. The reference platform looks like this, but the products will obviously be wrapped in corporate themed plastic. The phone itself is pretty unremarkable, a black slab-o-glass-that-doesn’t-copy-the-last-generation-Apple-product-really-please-believe-us design. This is a classic reference design, functional, full-featured, solid, and not especially fashionable, but it wasn’t meant to make MoMA curators call. The phone has the usual Android buttons, power, volume, camera, and a few jacks. The Motorola and Lenovo designs will change this completely, so what you see here isn’t indicative of much more than the hardware working in the correct form factor. You can see two Intel reference platforms above, top and left, with the top running a really rough early version of Android 4.0. 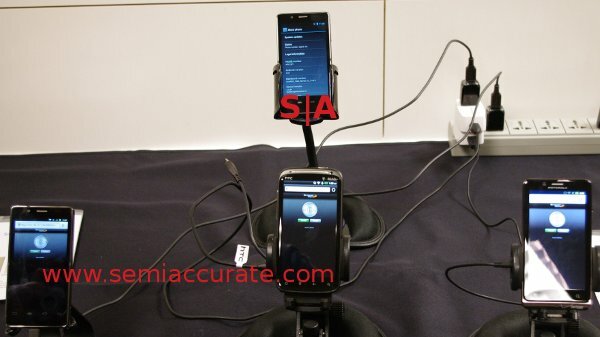 The bottom three phones are all running Android 2.3.x, and were used for testing during SemiAccurate’s briefing. In the center, you have an HTC Sensation and a Droid 3 to its right. In a happy coincidence, these three also are flag-bearers for Intel, Qualcomm and TI/ARM A9 cored CPUs respectively. Needless to say, it is about the best lineup you can ask for to test head to head. Intel showed journalists three categories of tests, CPU performance, power draw, and video tests. In Sunspider .91, the Intel phone burned through the tests in 1331.5ms, the Motorola/TI in 3887.9ms, and the HTC took up the rear by finishing in 6094.7ms. Saying that Intel has noticeably better CPU performance isn’t going out on a limb here. The raw numbers aren’t that impressive on paper, but the results were quite noticeable. During one run, the HTC was started, then the Motorola, then Intel, but the Intel finished first. Lets just say that for raw number crunching, Penwell/Saltwell beats the A9 core and the current Snapdragon. Did you expect anything else? Graphics tests showed Intel to be in the right ballpark given the GPU that is used. As we covered in earlier parts of this article, Intel uses the same GPU as a number of it’s competitors, so anything much faster or slower would be a real red flag. The phone basically performs where its rated clock speed says it should, both on the CPU side and the GPU side. If the reference platform was clocked at 1.6GHz, and when it was underclocked to a hypothetical 1GHz, performance in Sunspider should still be around 2x that of the A9 based OMAP4. GPU performance is mid-pack compared to current ARM offerings, but still doesn’t touch the Apple A5. Again, no surprises here. The next set of numbers put the performance in perspective. It isn’t hard to beat those Sunspider numbers with a 150W desktop CPU, but doing it with a power competitive SoC is. The test rig seen below is directly measuring phone power draw with the radios off. The test itself is something Intel calls SmartphoneMark 2.0: “Day in the Life” (SPM2). It is meant to simulate a day of phone use, and the benchmark is a work in progress. The testing rig looks like this. Intel was very up front about SPM2. In the current form, it was an initial stab at a mobile battery life benchmark, and it is meant to evolve. Luckily, it is both an extensible framework, and highly tweakable, the first set of tests are secondary to the framework and what it will hopefully turn in to. Currently, it simulates browsing for 1 hour, 20 minutes of SMS, 1.25 hours of talk, 18 hours of idle, 10 minutes of picture taking, 2.25 hours of music, and 1 hour of video playback. The idea is to simulate a typical day of use, and ‘typical’ is one of those benchmarking words that has lead to more heated wars than just about any word in history. Intel was quite receptive to suggestions on balancing the test, including inclusion of Apps and gaming. Don’t consider SM2 as it stands to be much more than a test of the above metrics, and look for a flurry of changes in the near future. This doesn’t mean SM2 is without merit, it has the capability to be a very worthwhile tool. Keep an eye on it, while fairly new and raw, things won’t stay that way for long. With that long preamble, we come to a short set of numbers, power use. On the test rigs above, the Medfield reference platform rated about 23 hours of use with a 1460mAh battery, and the other two were around 18 hours with slightly larger batteries. Given that this is a phone test, not a CPU test, there are a bewildering number of parameters that can affect the result, screen power draw being the most obvious. Even with direct phone power draw measured, it is hard to say much definitive about SoC power use. The take home message is that the Intel reference platform has more CPU power, about mid-pack GPU performance, and does so in a very competitive power envelope. Most tests had Intel parts ahead of the ARM competition, but some specific tests other chips edged Medfield out. With the limited testing we saw, Intel has a competitive part on the SoC and platform level, but again, there are many questions that won’t have answers until we see purchasable phones. From there, we moved on to GPU and video tests. On GLBench 2.1.0, Intel scored 33.1Fps in Egypt with no FSAA, 49.6Fps in Pro with no FSAA, with the Motorola hitting 28.5/43.5Fps on the same tests, and the HTC came in with 20.5/51.3Fps. As we said earlier, it is right in the middle of the current crop of GPUs, nothing to shout praise for or complain about. Last up is a set of tests on the video and camera subsystems. Intel was talking about three types of streams for testing, 720p30@40mbps, 1080p30@40mbps, and 1080p50@20mbps. The short story here is that the Intel chip could play 1080p 20mbps video at 50fps, the others could not. The three competitive phones didn’t play various higher rez and high bitrate streams, or had massive stuttering/locking issues. That video subsystem in Penwell seems like it can sustain the throughput needed for high end video streams. Most interesting is the burst performance of the Image Signal Processor, the Silicon Hive block. Intel was quite proud to show off the picture burst performance on the Medfield platform. Intel is only claiming a burst capture rate of 10 8MP pictures at a rate of 15Fps, but that is much better than the competition can hope for. The encoding hardware is rated for much more, both in terms of MP and throughput, so we feel this number could go way up on production phones if needed. That said, it was so much faster than either the Motorola or HTC phones used for comparison that it was laughable. This level of throughput is more likely limited by the buffer size or implemented memory/storage bandwidth than number crunching, a good sign for the future. Updated: January 18th, 2012 to include “mbps” to help those struggling with Charlie’s shorthand.